Welcome to the last installment (at least for a little while) of fresh summer corn recipes. I know I’ve been all [summer] end of days on here lately, but I can’t help but mourn the passing of corn season. Do I sound like a broken record yet? Are we still friends? Can you even stand me anymore? I know most of you are probably not at all ready for soup season, and I 100% get it. I don’t live it, but I get it. I know not everyone is on board with soup this early in the fall season (or, if you want to be technical, this LATE in the summer season. It’s not technically over for another two weeks). 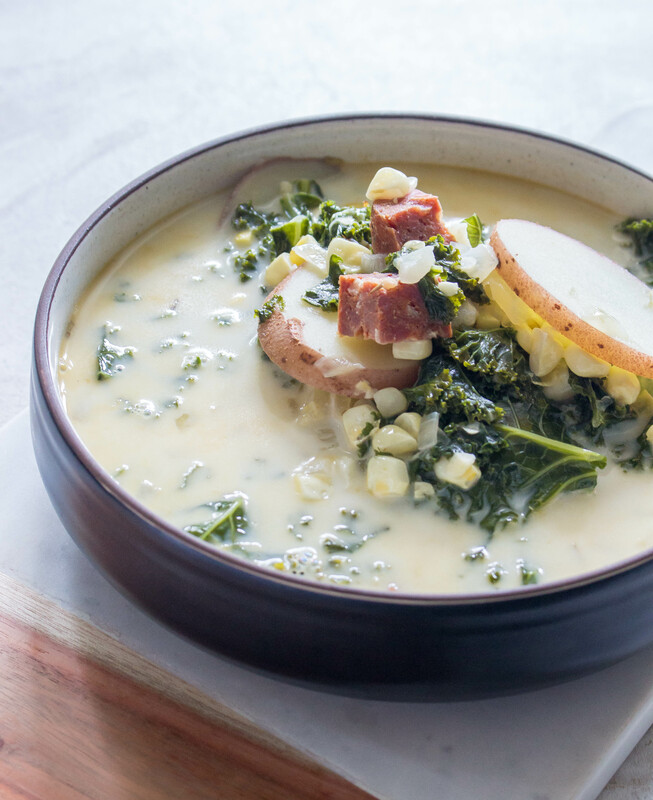 If you fall into that camp, promise me that you’ll raid your local farm stand ASAP and stock up on the fresh corn for this soup in a few weeks (months?) when summer is long over. You’ll want to freeze it just for this. Promise me! It’s so worth it. I promise YOU. 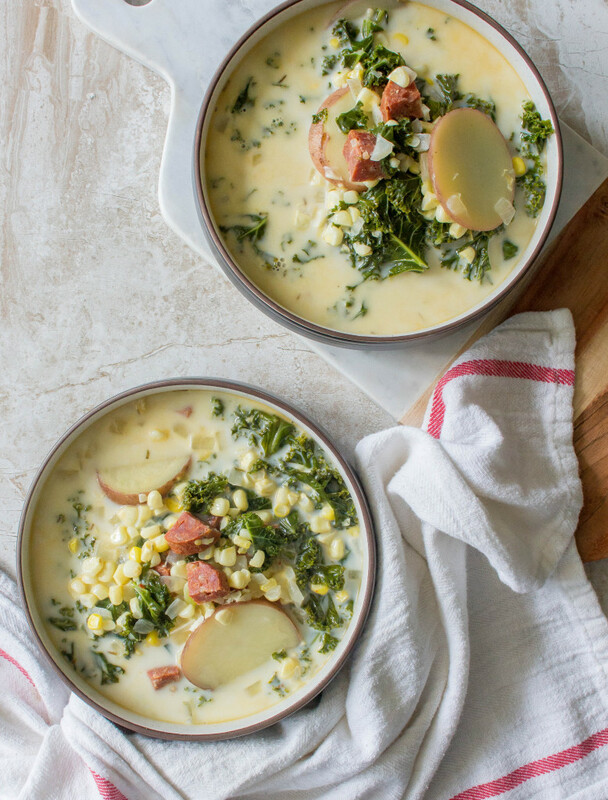 Even though I’m calling this “end-of-summer” soup, it could definitely be made smack dab in the middle of summer, too (if you’re in my camp: the “I-eat-soup-year-round-so-deal-with-it” camp). Or, like I state above, in the more appropriate seasons of fall and winter. 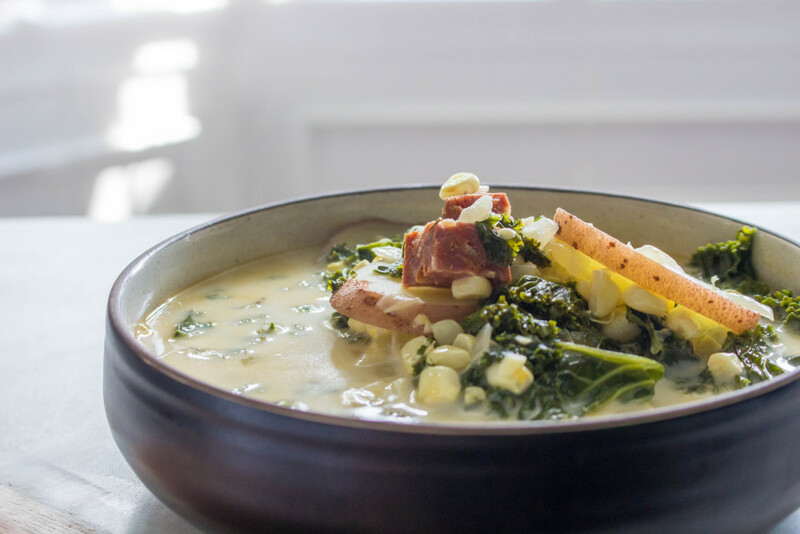 Stock up on the summer corn while it’s good, cut it off the cobs, and freeze it until you’re ready to use it. I do this every August. I go on a corn-hoarding spree. It makes those December chowders oh-so-much better. And the emotions that go along with summer still feeling forever away? It slays them. Because we’re getting to eat SUMMER corn in December! It’s a true win. Anyway. Enough about the damn corn. I am annoying myself. 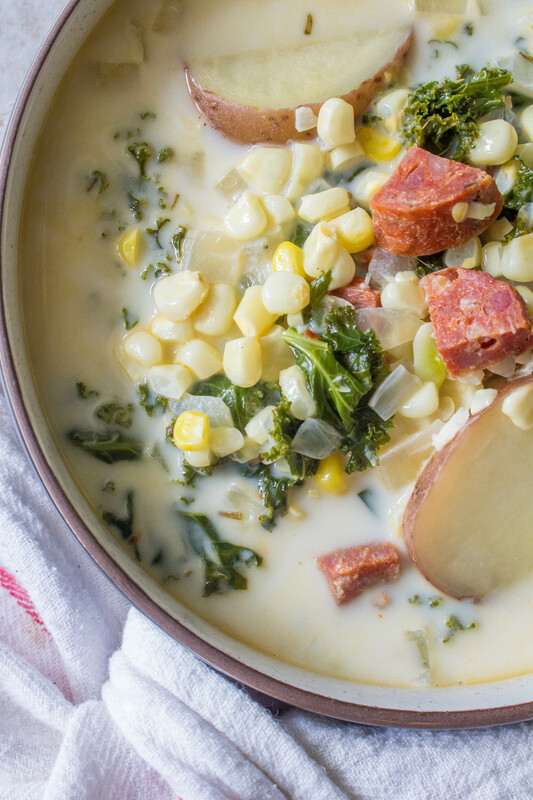 This soup is loaded with flavor…and comfort. It’s also pretty healthy, too. I love soups like this because you’ve got a whole meal in one pot. 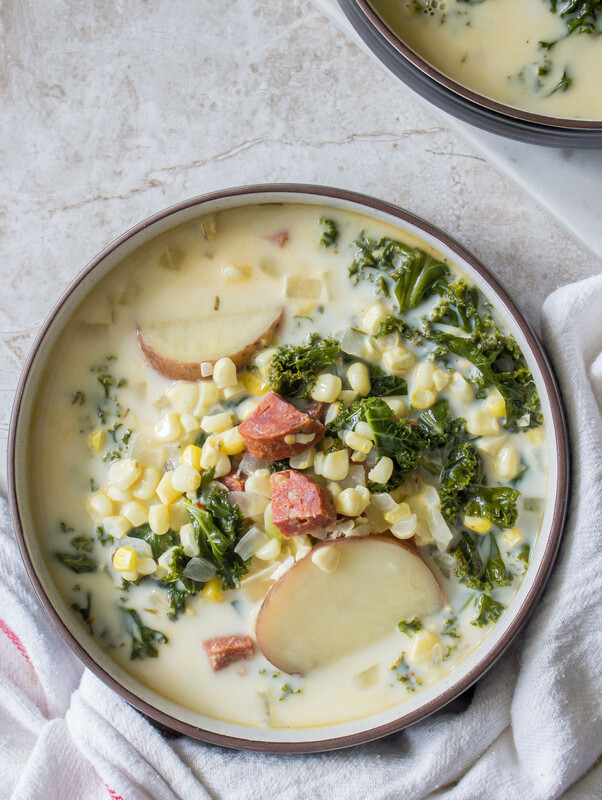 You’ve got greens in the way of kale, starch in the way of potatoes, meat in the way of chorizo, and….corn (sorry. I couldn’t leave it out of the ingredients list! 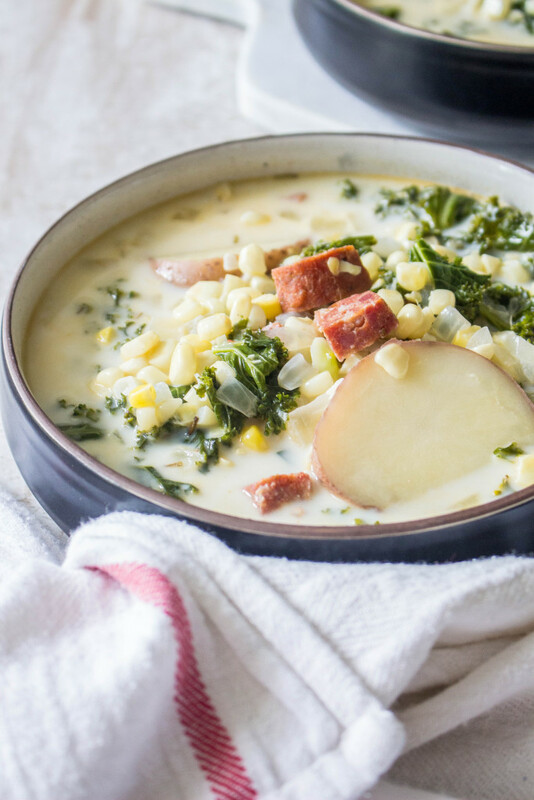 )…all swimming together in a flavor-packed, cozy, and slightly creamy broth. It’s meals like this that get me through long workweeks and a busy social life. You cook it once and eat it thrice. And it still tastes just as good, if not better, the third time you eat it! Awesomesauce. Another reason to make this soup? If you’re like me, you’re just getting over an end-of-summer head cold (which you and your husband have managed to pass back and forth to each other like three times. Ugh.) and all you want is a big, honkin’ bowl of soup. When chicken noodle isn’t going to cut it, I cook up something more interesting. Something with chorizo and potatoes…and corn. I told you there was a good reason for soup in summer. End-of-summer soup for an end-of-summer cold. Place the potatoes in a medium pot and cover with cold water. Place the pot over medium-high heat and bring to a boil. Cook until the potatoes are just tender but not completely cooked through, about 5 minutes. Drain. Once cool enough to handle, cut or slice the potatoes into desired shape/size. Meanwhile, add the chorizo and the olive oil to a large pot over medium heat and cook until the chorizo is crispy. Remove the chorizo from the pan and place on a plate lined with paper towels. Set aside. To the drippings, add the butter and once melted, add the onion. Cook for 5 minutes and then add the garlic, thyme, dried herbs, and red pepper flakes. Cook for another few minutes and then stream in the chicken stock. Bring to a simmer. 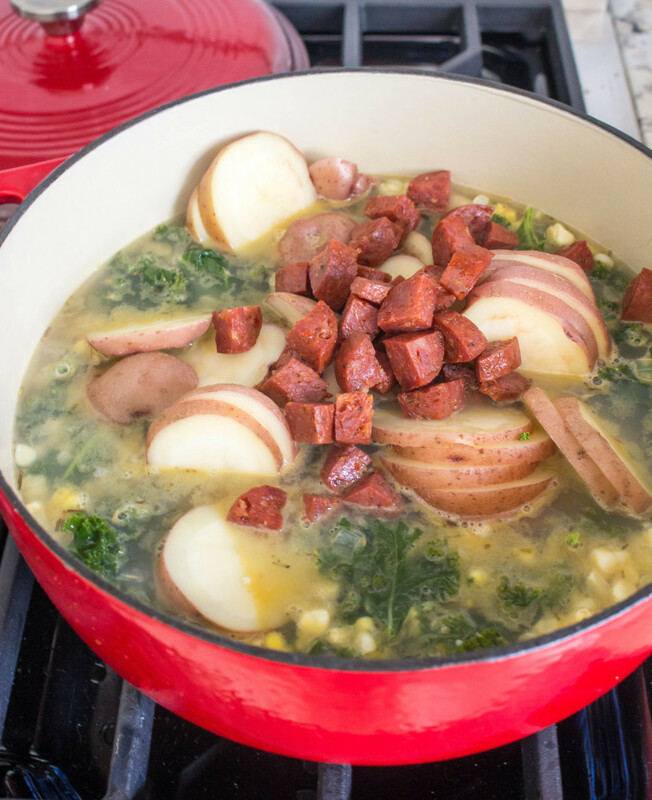 Add the kale, corn, and reserved chorizo and potatoes to the pot and partially cover. Simmer for 10 minutes or until the kale is wilted and the corn and potatoes are cooked through. Add the half-and-half and warm through. Season, to taste, with salt and pepper. Serve warm. I chose to use precooked, cured chorizo for this soup so that the end product would have big chunks of the sausage throughout. 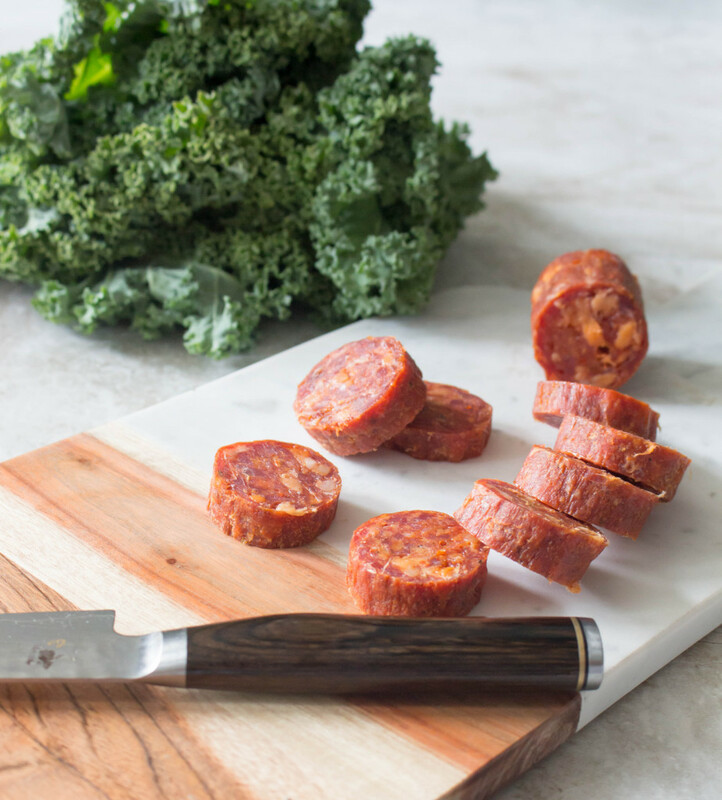 If you prefer, you can start with uncooked bulk chorizo and crisp is up like regular sausage (casings removed and cooked until browned and completely rendered). Make sure to drain off some of the drippings if you use this method, otherwise your soup will end up a little oily. Your resulting soup will have smaller bits of chorizo floating throughout, rather than the larger, meatier chunks you see pictured in this post. Oh wow, what a delicious and hearty soup! This looks like a great dish to help us transition from summer to fall. I wish I could dive into a bowl of it right now! THIS! I have a lot of travel coming up this fall, so I’ve been trying to stock my freezer up so I have plenty of healthy meals to come home to, and have been looking for some new soup recipes to try. This one is definitely happening this weekend, I’ll let you know how it turns out! Update: I made this over the weekend, froze half and have been eating the rest for lunch. I love the unexpected heat in the broth from the red pepper flakes! And I used Italian sausage instead of chorizo because that’s what I had in the freezer, but the substitution worked great. Thanks for the great recipe! September 1st is my official start of soup season – I don’t care what the temperature is! All of the flavors in this sound delicious and it looks so comforting. We made this the other night and it was amazing. Thank you! This is similar to the Olive Garden Tuscan Hills that is made with Italian sausage and no corn. I love the other soup and may try these changes, they sound delicious also. Yes, it is very similar to that soup! I hope you enjoy it. It’s one of our favs. Thanks for sharing! It looks like one my husband would eat too! i hope you both enjoy it! Thanks, Vanessa!